Includes volume control, battery status, wifi status, gmail unread, CPU, hard drive, external drive, media key, and disk drive eject skins. You did a great job on these, love the media keys especially! Nice and small. Is the gmail supposed to show information though? All mine does is take me to my account when I click on it. I have had new mail but it does not show info for me. It's not a config problem on my end because like I say it will open my account when I click on it. The gmail icon should change if you have unread, and an unread count should show. Clicking the link just goes to www.google.com/mail, and if it is taking you straight to your account it is probably because your browser has saved your session, not because the skin is doing so. If your password contains special characters, you might need to encode it here: http://meyerweb.com/eric/tools/dencoder/ and use the encoded result for the skin to work. Well that is a mystery to me then because I use FireFox and I have it so it does not remember my last session yet clicking on it takes me directly to my account. It also still does not show any unread mail and I have 8 in my inbox. 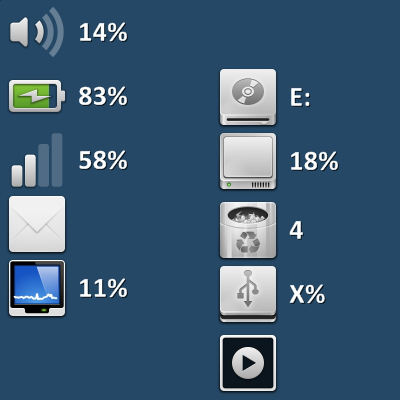 I know a thing or 2 about rainmeter so i will open the ini and see what is going on. OK I got it to work but I had to do some editing. I now have it so the number of emails show on the top of the icon along with the word GMail at the bottom.